My husband and I used to go out for sushi pretty often. Our favorite place to go was Sushiville. 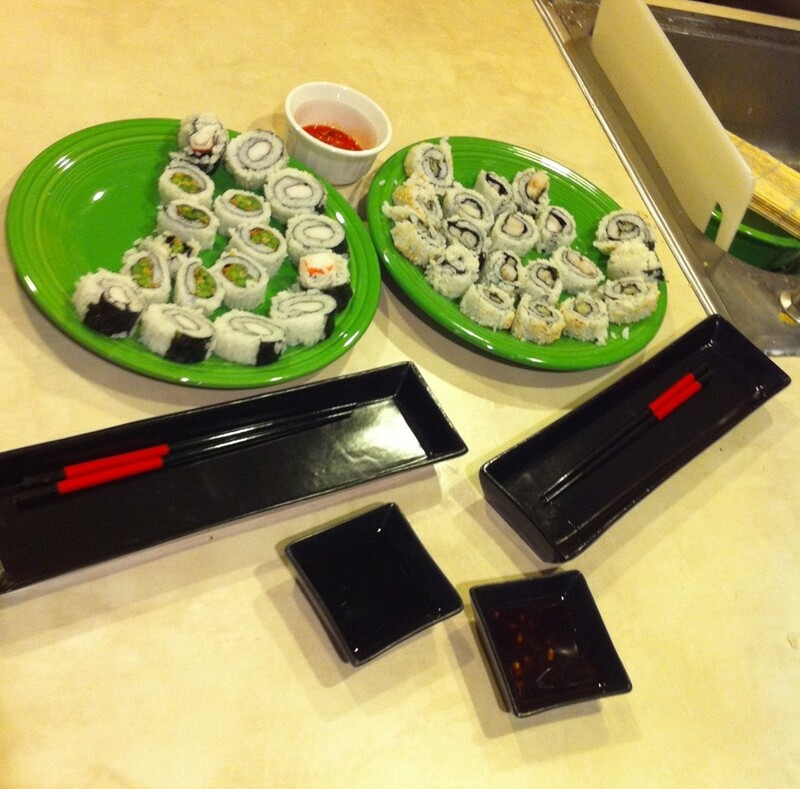 We would get lots of different things, but the best was always the fresh made, warm, crunchy Asparagus rolls. Notice all the past tense being used? This is because seven months ago we had our baby girl! After her arrival I became a stay at home mom and our budget officially became tight…which led to a lack of sushi outings. Where did you go Asparagus roll? After a while we really started to miss our asparagus rolls. We decided to take a trip to our local Asian grocery store to pick up the supplies needed to make our own. 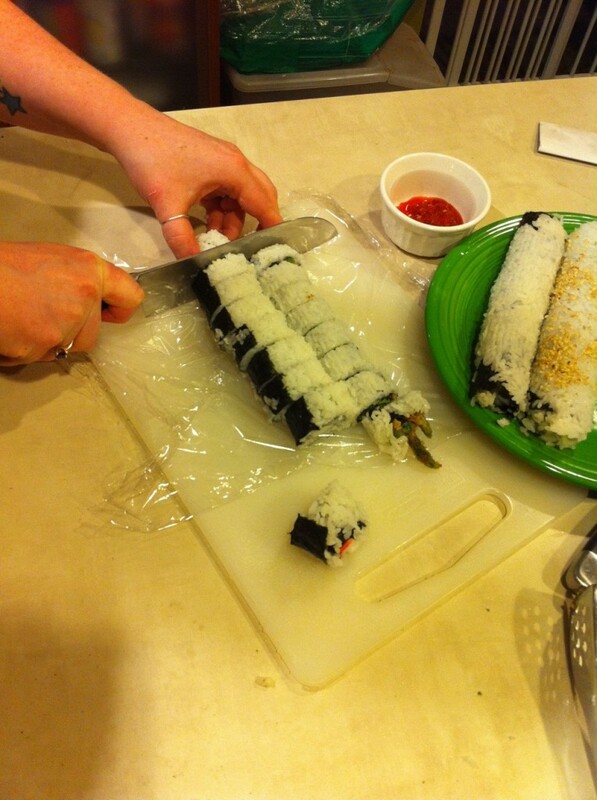 I was a little nervous because I had heard over and over again that making your own sushi was a difficult task. We weren’t even quite sure what we needed so we referenced some online material and searched the store for what seemed to be the correct ingredients. We ended up with dried seaweed sheets, rice vinegar, sushi rice (yes! you use a special kind! 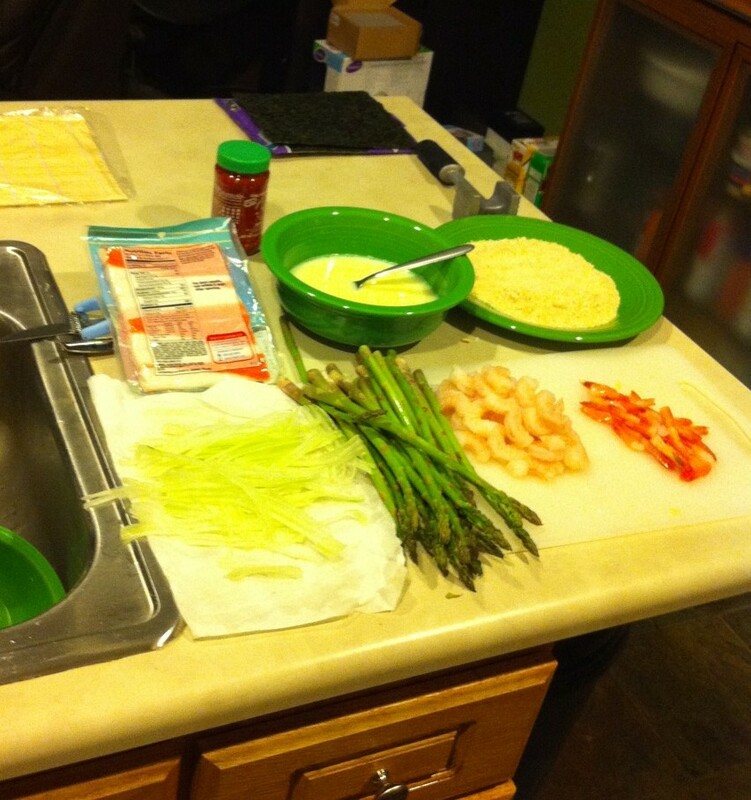 ), a bamboo roller, shrimp, crab and of course asparagus. Once we got home we also added a cucumber from our garden into the mix. 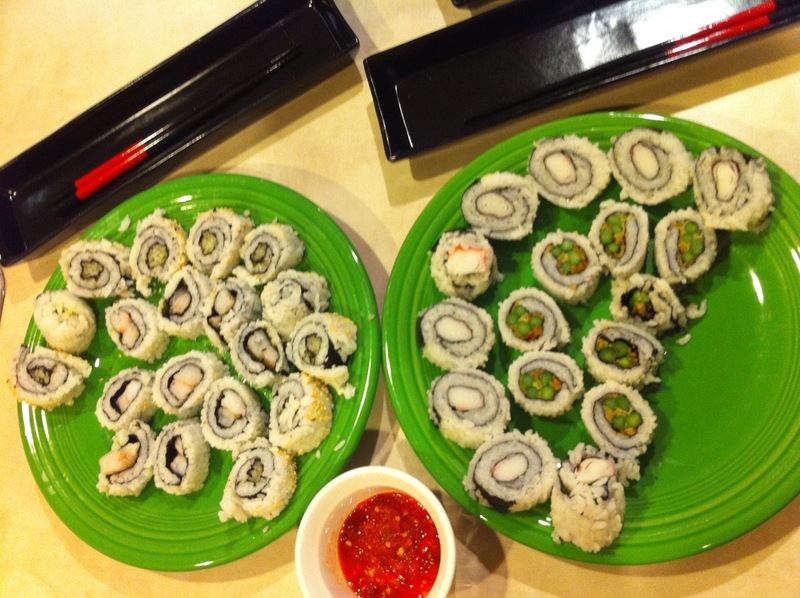 The plan was to make several types of rolls, but of course we would make TONS of asparagus rolls. 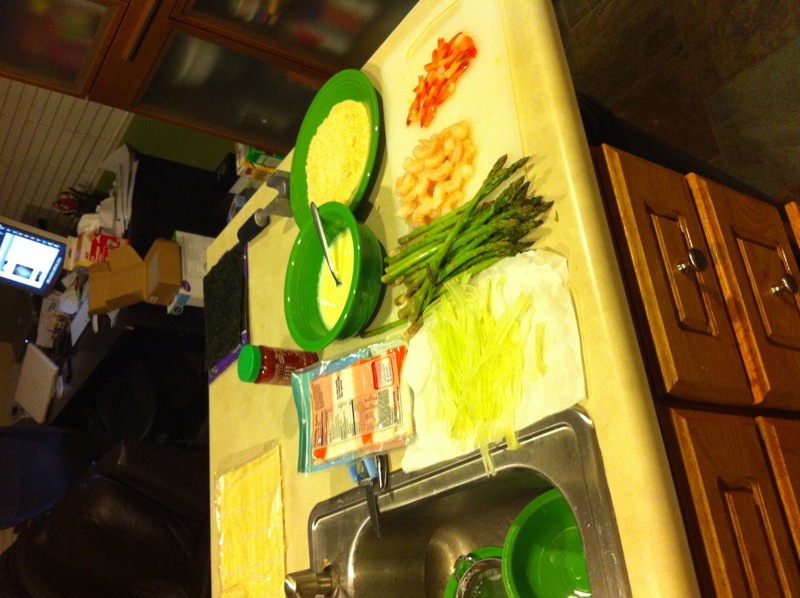 I cooked the rice, chopped up all the ingredients and breaded and fried the asparagus spears. We were now ready to go forth and roll. I nervously spread the rice onto the bamboo mat. Next I placed the seaweed on top of the rice and put my desired ingredients down. Mimicking the chefs at Sushiville, I carefully rolled and pulled, rolled and pulled until I ended up with what turned out to be a pretty darn good roll! 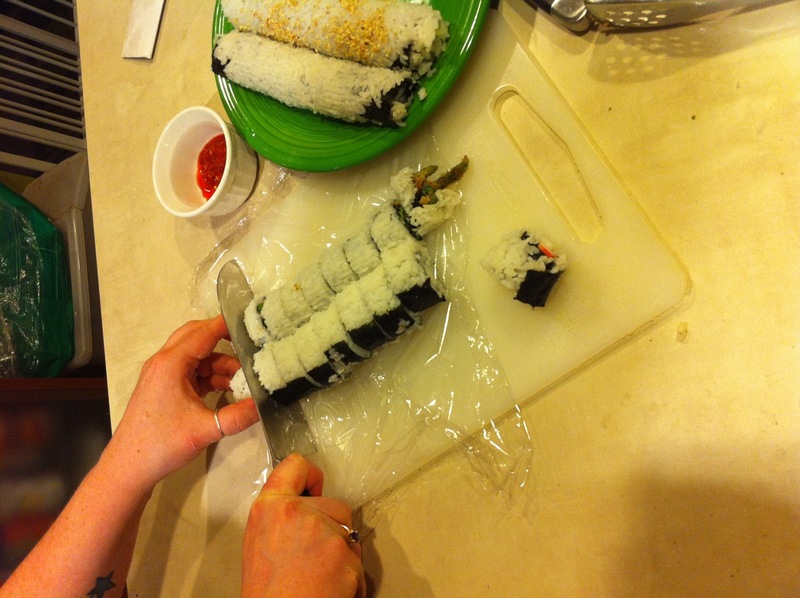 I then chopped the roll into individual pieces and Ta da! We had more than enough sushi to fill the both of us! The greatest part? 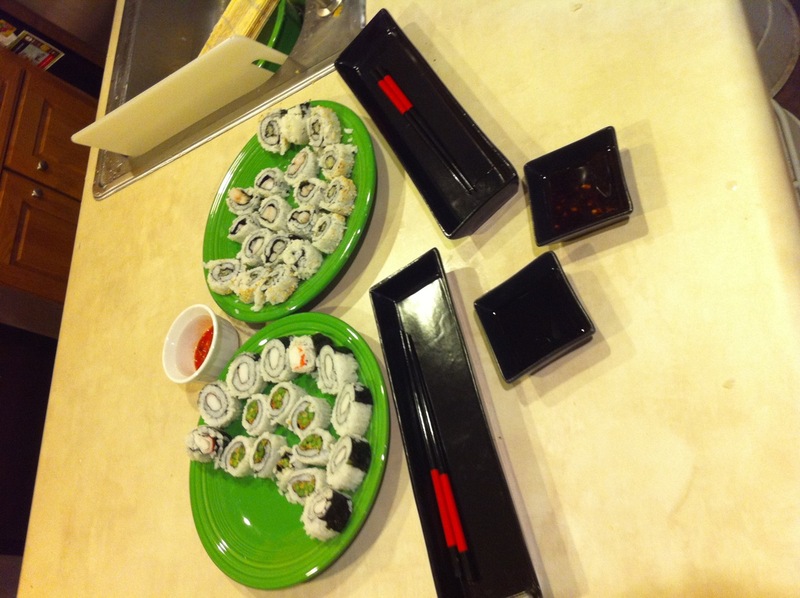 (well…besides stuffing our faces with as much sushi as we could…we even had leftovers!) It only cost 1/3 what it does to go out for sushi! Not to mention we still had enough seaweed and rice leftover to have the same meal two more times! Sure, it’s nice to go out and let someone make dinner for you, but how can you justify it when you can afford to eat sushi every night if you just put forth a little effort at home?! I promise it is a lot simpler to make than it seems. Try it out sometime! This entry was posted in Cooking, Dinners, Saving Money. ← Hair Attitudes: Now taking Blythe clients! Wonderful post! 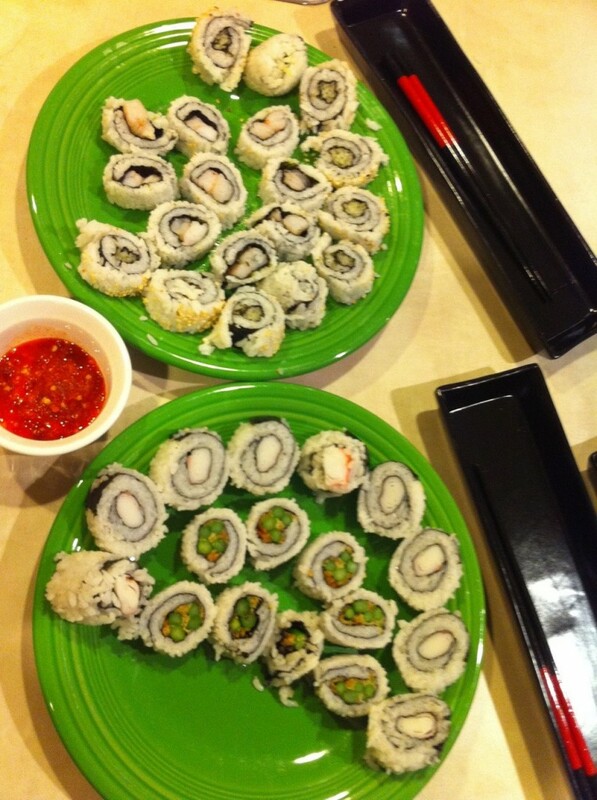 Jon makes the best sushi! We stopped going out for Sushi when Julia was born too.